The Courier | She speaks. Parts 2 and 3 of my interview with John Tobia have been uploaded to my YouTube account, SableMinded. Look for my story about Tobia and the fantastic job he’s done with the department over there. I had an interview with John Tobia earlier today. Tobia is the director of the Monmouth County Public Works, headquartered in Freehold. I was not familiar with what the department had done during the past year. What I learned is that the department has done quite a bit. Tobia is a very efficient director, consolidating and cutting costs by integrating the entire public works. He said the department works as a team, and that the concept of shared services is part of the reason public works was able to save so much money. Below is a video interview with Tobia. He explains how the department analyzed each division of public works, consolidated and, in turn, saved a lot of money for Monmouth County. One thing he highlights in this video is how public works began using in-house professionals rather than contract outside corporations for projects and tasks involving the county. He’s a very well-spoken person. It’s nice to meet those every once in a while. I will be posting two other videos below. Check them out, too. 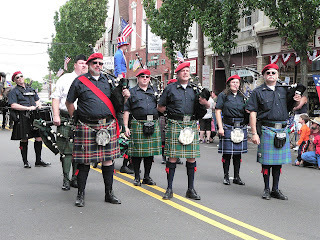 The Courier Web site has more pictures online from its coverage of the Bayshore Memorial Day parades. 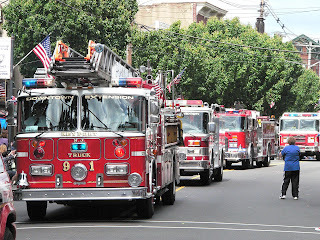 The borough’s third annual Memorial Day Parade was quite a success, as many residents turned out to see the floats, marchers and firetrucks. 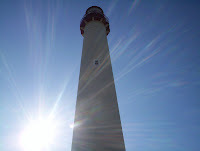 Below are a few of the moments I captured in a click. 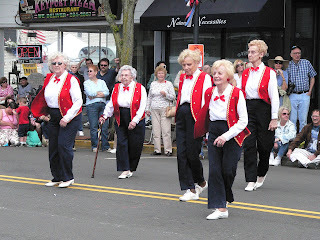 To read about the parade and see more pictures, pick up a copy of this week’s Courier. Kevin Boss, tight end for the New York Giants, visited St. John Vianney High School on Tuesday. A starter for the Super Bowl XLII Champions, Boss came to Holmdel to reward the students for raising over $30,000 for the school’s annual Walkathon. No. 89 said it’s awesome he gets to do things like this for the community. Boss and the G-men are currently in the off-season, but he told me the team has already begun practicing. To read more about Kevin Boss and his visit to St. John Vianney, pick up this week’s issue of The Courier and tackle the sports section. For more information on the New York Giants, visit the team’s Web site. On a side note, Courier Publisher Jim Purcell is slowly coming around to the idea that the Giants really did, in fact, beat the New England Patriots in the Super Bowl this past February. What was the score again, Jim? As the Bayshore continues to be strung along with the possibility of flood insurance, thanks to the newly updated Flood Insurance Rate Maps (FIRMs), I am posing questions to the peoples’ state representatives, Sen. Robert Mendendez and Sen. Frank Lautenberg. “[The Courier is] putting together a story regarding Congressman Frank Pallone’s legislation to put a moratorium on FEMA’s implementation of the newly redesigned flood maps, particularly in the Bayshore. Many Bayshore municipalities are passing resolutions in support of his legislation. 1) The legislation itself, does he support it? 2) What the Senator thinks about the Bayshore supporting Congressman Pallone’s legislation. Plain and simple: I want answers. So should you. Please call both Senators’ offices and let them know you support Pallone’s legislation and want them to do something about this situation, too. If anyone receives any interesting comments, feel FREE to send them to me at: ms.melissa.gaffney@ gmail.com or by calling (732) 957-0070, ext. 6127. Former Staff Writer J.J. Sullivan no longer works at The Courier. When you call (732) 957-0070, ext. 6127, you are calling Melissa L. Gaffney.